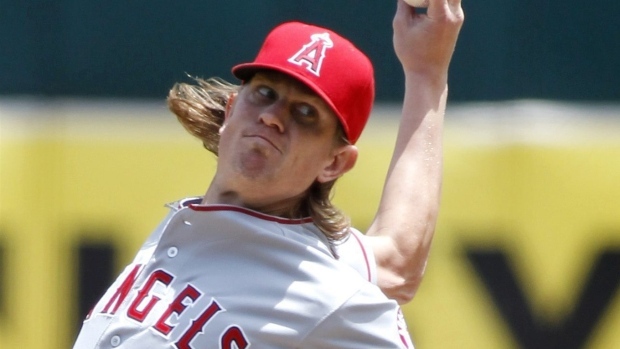 OAKLAND, Calif. - Los Angeles Angels pitcher Jered Weaver has been placed on the 15-day disabled list and will undergo an MRI on his left hip. One day after Weaver suffered his fourth consecutive defeat in the Angels' 4-1 loss to the Oakland Athletics, the Angels decided to put the right-hander on the DL to give his sore hip time to rest. The move was made before Sunday's series finale between the Angels and Oakland. Weaver (4-8) said that he's been bothered by soreness in his hip for some time, but doesn't think it's related to his current slump. Still, the Angels are taking a cautious approach with their 32-year-old pitcher, who last won on May 30. In his four starts since then, Weaver has given up 19 earned runs in 26 innings. Outfielder Alfredo Marte was called up from Triple-A Salt Lake City to take Weaver's roster spot.